As a long-time volunteer I want to support Refugee Community Kitchen from afar by putting together a recipe calendar. Many have enjoyed, and at times, lived off of Refugee Community Kitchen’s top notch food. It’s seriously delicious and nourishing and almost everyone who tastes it wants to know how to make it again! I asked some of the chefs to scale down their recipes from being able to serve thousands to more manageable sizes, so that we can all prepare delicious Refugee Community Kitchen meals at home. We want to make 2019 a year of awesome food for you! A suggested donation of £10 per Calendar will cover production costs and still make a meaningful £4 contribution to Refugee Community Kitchen. £1 = 2 hot, nourishing Refugee Community Kitchen meals. That means that for every calendar, you are providing a minimum of 8 meals! Refugee Community Kitchen is run by some of the most dedicated, hard working people you'll ever meet. They continue to sing and dance despite the oppression and trauma they witness on a daily basis and they continue to pour compassion and love into every aspect of the work they’re doing (currently preparing over 2000 meals a day). It's comforting to know that some of the most amazing individuals are working day-in and day-out to fill bellies and put smiles on peoples' faces. The sad reality is that Refugee Community Kitchen is often the ONLY source of food for refugees in northern France. A huge responsibility and undertaking that they have unfailingly shown up for every day since 1 December, 2015. On top of this, they provide weekly servings of hot food to people in need in Camden, Hackney and Bethnal Green AND they've sent truck loads of food donations to places as far as Bosnia and Syria. In the face of diminishing donations, increasing numbers and the huge expense of preparing over 60,000 meals a month, Refugee Community Kitchens continues to do the right thing and never lets obstacles get in the way of its mission to serve high quality food to those who need it most. Please support them by ordering a Calendar for yourself and everyone you know! 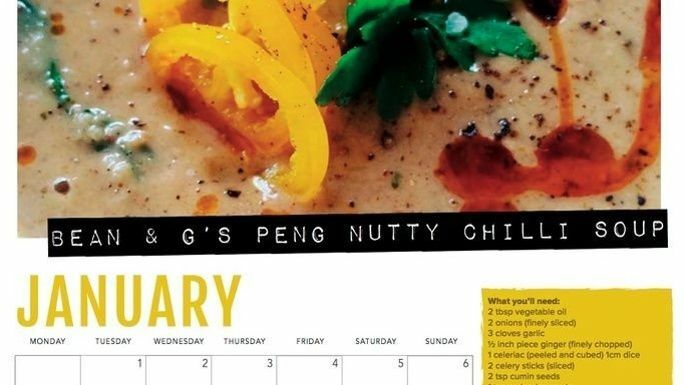 The 2019 calendar, full of Refugee Community Kitchen recipes for you to make at home. Each donation will go to serving hot, nourishing food to refugees, homeless people, and anyone who needs it. A gorgeous wall calendar to keep you inspired in the kitchen all year long!